How many times have we seen James Bond jump out of a plane, sans parachute, free-fall while talking on a cell phone, then gracefully land on the deck of a yacht that just happens to be sailing by? Sounds like a lot of fun. Sure is. But about as far from the skydiving truth as possible. The injury rate is about one per 700 jumps, according to the British Parachute Association (BPA). "This method requires significant training and carriers a higher injury rate [one injury per 160 jumps] than tandem jumps," according to the BPA. "It demands significant self confidence and personal discipline." Static line - traditional jumping is old-style skydiving - with a round parachute that opens within a few seconds of leaving the aircraft, via the static line. If you are looking for the James Bond experience this type of jumping is for you. These jumps require significant training and have an injury rate of about one per 60 jumps, according to the BPA. 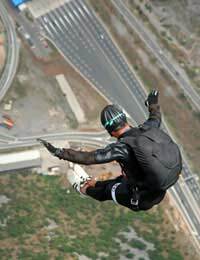 This type of skydive obviously requires an extensive amount of training and has the highest injury rate at one per 250 jumps, according to the BPA. I have just found out I'm 7 weeks pregnant. I have a skydive booked. I am worried if I skydive I will miscarry. Is it too late to jump or will it be safe?